In addition to the Spanish language, we will look at Spanish life, culture and history. In all courses, including beginners, only Spanish is spoken. This programme includes 4 hours with the Intensive group plus an extra 2 hours focused on listening and speaking skills. These courses are recognised as educational leave or “Bildungsurlaub” in many German states. These classes are tailored to the individual needs and learning strategies of each student; recommended for students who want to meet specific goals, such as preparing for exams. This course entails 4 lessons per day. In addition to concentrating on the Spanish language, we will look at and discuss various themes such as geography, history and literature. In all courses, including beginners, only Spanish is spoken in class. You will be encouraged to speak and make active use of the grammar and vocabulary you are learning. Students with no previous knowledge will be directly assigned to a course for beginners; all other students will take a written and oral exam to determine their level. To ensure that no class time is lost, this test is performed on the first day of school before starting the course. Depending on the level of knowledge of students, homogeneous groups will be formed in order to further effective learning. We offer this course for all levels. 2 – 8 participants per group. 20 lessons per week. During the winter break you can book individual lessons, the prices are reduced by 20%. Courses start every Monday for all levels. Courses start on Monday and end on Friday. 2019: 28.02., 19.04., 01.05., 15.08. and 01.11. In addition to the intensive course (4 lessons per day) an extra 2 lessons can be booked which focus specifically on listening and speaking skills. 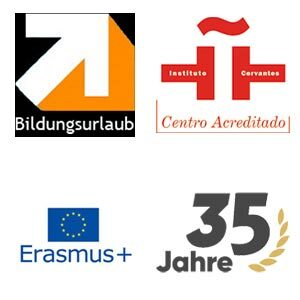 These courses are recognised as “Bildungsurlaub”(educational leave) in many German states. During the two additional lessons everything learned in the intensive Spanish course will be practised intensively and problems encountered by students in their language learning will be addressed. This course is suitable for students who want to learn Spanish in the shortest possible time. 2 – 8 participants per group. 30 lessons per week. This program includes an intensive 4 lessons per day in the classroom plus an additional 2 lessons with individual tutoring. These classes are tailored to the individual needs and learning style of each student. The course is recommended for students who want to meet specific goals, such as preparing for an exam. We offer this course for all levels. This course is also recognised as educational leave or “Bildungsurlaub” in many German states. 2 – 8 participants per group. Number of lessons: 20 lessons in the group plus 10 lessons private tuition per week. Private lessons mean flexibility: students can set their own learning goals and pace and to a large extent select topics themselves. In addition dates and times of lessons can be chosen as they suit the individual. This option is particularly suitable for students who wish to prepare for specific exams or learn Spanish for a particular profession, and for those with a higher language level or who simply prefer to learn alone.. Minimum 2 lessons per day. We can commence courses at any time or date with prior arrangement. During the winter break the prices for individual lessons are reduced by 20%. In addition to the intensive course (4 lessons per day) an extra 2 lessons of individual tuition can be booked. This combination is recommended for students preparing for an exam or with another specific aim. We offer this combination for all levels. These courses are recognized as educational leave or “Bildungsurlaub” in many German states. 2 – 8 participants per group. Number of lessons: 30 lessons in the group plus 10 lessons private tuition per week. A knowledge and command of various languages is practically a must in our modern world. And what better time to learn – with ease and enjoyment – than when you’re young? So a language trip is one of the best investments you can make in a young person’s future. Conil is an ideal destination for young people. While it offers plenty of scope for sporting and social activities it has all the advantages of being a small town, where every destination can be easily reached on foot. Students get to know Andalusian culture and the Spanish way of life in a group of young people of their own age, and come home with a renewed motivation to continue learning the language. We offer opportunities for meeting Spanish school students by inviting the young people who learn English or German in our school to take part in joint events. Besides language lessons the Academia Atlantika offers a full programme of sporting and cultural activities. With the consent of their parents, young people from the age of 16 can stay in shared apartments. Available for students from 16 years of age. The price includes: Spanish Course, accommodation, 2 half-day tours, extensive cultural activities and transfers from Jerez airport – Conil – Jerez airport. 2 – 8 participants, 20 lessons per week. At an additional fee, 30 lessons per week can be booked. Optionally the Preparation Course for School Leaving Exams (10 lessons per week) can be added. The price includes: Spanish Course, accommodation, meals with the host family, 2 half day tours, extensive cultural activities and transfers from Jerez airport – Conil – Jerez airport. Courses start on Monday and end on Friday. In collaboration with sixth-form teachers in other countries we have developed a training programme tailored to the needs of high school students learning Spanish as a second language. This programme includes the basic intensive 4 classroom hours plus 2 additional hours where specific focus is placed on the content of the exam. This course can be combined with the Spanish course for young people. Students taking this course will either stay with other students of the school in an apartment or with a host family. Preparation for School Leaving Exam: 2 – 5 participants, 10 lessons per week.